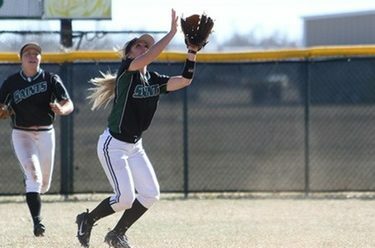 LIBERAL, Kan. – It was a tale of two games for the Seward County softball team (5-9), splitting the Sunday afternoon doubleheader against Lamar, winning the first game by the run-rule, 10-1, before losing the second game 5-1. Monique Ashley (5-3) started in the circle, pitching all five innings while giving up just one run on three hits. She also added eight strikeouts to her season total. Four Lady Saints had mutli-hit games. Sydney Epp and Madeline Owen each got two hits in the win, while Jullian Atteberry and Kaitlin Ammermann both reached base three times. Atteberry led the Saints with three RBI, two coming from her 5th inning homer. Seward got on board first in the second innings. Ammermann doubled before Paige St. Pierre walked, putting runners at 1st and 2nd. Lexi Manyik advanced the runners to 2nd and 3rd, hitting into a fielder’s choice. Sage Harrison walked to load the bases for Raelyn Sanchez, who took advantage of the situation by driving in Ammermann. The Lopes quickly tied the game up in the third inning. With the first two batters getting out, Lamar had two straight doubles to score their lone run of the game to tie it at one. It didn’t take long for the game to get out of hand. A single by Epp, followed by a Leena Mortensen walk, put runners at 1st and 2nd for Madelin Owen, who knocked in Epp on a single, but was caught trying to extend her single into a double. An Ammermann triple on the next pitch made it 3-1. St. Pierre reached base after being hit by a pitch. Lexi Manyik struck out on the next at bat, but Pierre stole second. During the confusion, Lamar tried to catch Ammermann at third, but an errant throw allowed her to reach home and pushed St. Pierre up to third. Harrison singled with the next at-bat to make the game 5-1. Sanchez was walked before Atteberry knocked in Harrison with a single to right field, advancing Sanchez to third in the process. On a passed ball, Sanchez stole home, before Epp singled to short stop to score the seventh run of the inning, giving Seward an 8-1 lead. Neither team could get anything going in the fourth, but the Lady Saints saw an opportunity to end the game and took it. Needing just one run to run-rule the Lopes, Sanchez led off with a walk. Atteberry took her first pitch and sent it over the left field wall to end the game, giving the Lady Saints the 10-1 win. Jordan Cordrey (0-4) started in the circle in game two, pitching all seven innings in the loss. She gave up three earned runs on 11 hits, while striking out three batters. The Lady Saints managed just five hits in the game and Manyik was the lone Lady Saint to come away with an RBI. Lamar jumped on top first with a one out RBI single to left field. With the next-at bat, the Lopes doubled to center field, scoring their second run of the inning to take a 2-0 lead. It appeared Seward would get back into the game, cutting the deficit to one point in the second inning with a Manyik double to left field, scoring Owen who reached on a leadoff single, but that would be all Seward could manage for the game. The Lopes extended their lead in the fourth inning. With a leadoff single and stolen base already in place, a double to left field scored their first run of the inning to make it 3-1. Another double put runners at 2nd and third. A single to left field brought the score to 4-1, but a fielding error by St. Pierre allowed another run to cross the plate, making it 5-1, Lamar. The Lady Saints had their rally caps on in the bottom of the seventh inning but couldn’t quite pull off the comeback. Seward loaded the bases for Atteberry, but a ground out to third base ended the game, as Lamar won 5-1. The Lady Saints will be back in action on Tuesday, traveling to take on Northern Oklahoma-Enid at 2:00 p.m. in Enid, Oklahoma.